"Tahini-free hummus that only takes minutes, and is a favorite with my kids." In a blender or food processor combine garbanzo beans, garlic, cumin, salt and olive oil. Blend on low speed, gradually adding reserved bean liquid, until desired consistency is achieved. 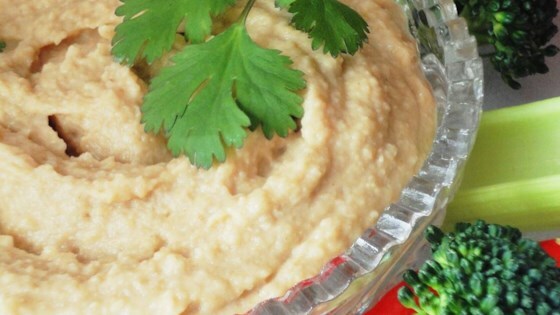 Healthy dip made from garbanzo beans. This hummus was pretty good, but it was sort of bland. It was a lot better after adding paprika, a few drops of chili oil, and some sesame seeds. This recipe is yummy and easy to make. It is even better if you blend in the juice of half a lemon. My girl scout troop made this, and it was a big hit with them! Parents are now asking for this recipe. Note: I liked it even better with 1/2 teaspoon of lemon juice added.